Head to enduranceplanet.com/shop for a bunch of cool products and services we’ve come to love, use and endorse. Everything we offer is centered around helping you achieve the ultimate in health and performance. Also when you shop through endurance planet you directly help support the podcast so we can continue to provide you with great content always for free… Get started now on the path to optimizing your health and performance! Be sure to check out PerfectAmino, whether powder or pill-form, is an athlete’s secret weapon featuring all the essential amino acids in the exact ratios needed to ensure proper protein synthesis in the body. You can support EP when you shop on Amazon! It’s super easy: Just be sure to open Amazon via enduranceplanet.com—it’s just one extra click to link to Amazon through the sidebar banner (to the right of the page) or click the Amazon links in the show notes. Thanks for supporting the show. The Sock Doc, Steve Gangemi, is back to tackle the topic of genetic testing and whether finding out your DNA via testing is worthwhile or not, as well as answer your other questions! DNA is the long-term information storage. Via transcription, RNA is formed, and this is how the gene expresses itself = epigenetics. Circadian rhythms turn ~50% of genes on and off each day. Environmental factors are important here. Be careful of correlation vs. causation with genetic tests. Pros and cons of genetic tests. They may give data but not necessarily information that we can use. Even with tests, there are few things we can predict – it’s too complex. Timing is what’s important – what does that mean and why. Using genetic tests to make individualized nutritional recommendations, aka the emerging field of nutrigenomics. If your genetic test says you’re can metabolism a substance well or not (i.e. caffeine, alcohol) is that the be all end all? maybe not. health status matters. 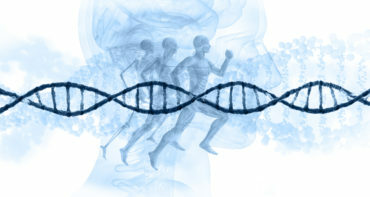 The athletes you see do better on a certain diet may likely have that encoded in their genes, due to ancestry and/or childhood rearing, and, thus, their gene expressions (performance) respond optimally when they re-align with their genetic predisposition – but this is not yet verified in the literature. Associations with diet improvement based on genetics (e.g. will some do better on low-carb, like those with FTO? ), but we’re not there with genetic-based interventions. Take homes: clinical application and applying these tests to your own needs. Other health tests that may be more worth your buck and why. Ramping up intensity and/or volume too quick is often the fast track to injury, take the time to heal and utilize a practitioner who will provide hands on help. Should someone with a leg length discrepancy use orthotics? Or should you first identify if it’s a true leg length discrepancy or some other underlying issue that can be fixed? True leg length discrepancies are rare.